This is a question we get asked all the time, and we know exactly how you feel. Sometimes it feels like you’ve written everything you can on a topic, sometimes you’re not sure what your customers are reading, sometimes you just don’t have any inspiration. We’ve all been there, and so we decided to put together this guide on how to find blog post topics to write about. Step 1 – Understanding your audience. I know this point isn’t exactly giving you ideas straight off the bat, but understanding the types of people who are visiting your site and who are buying from you is always the first step to creating a content creation plan. The beauty of this step is that it is actually a lot easier to do than you might think. I am assuming you all use some form of Analytics (We use Google Analytics, and chances are you do too.). If you don’t, then get in touch with us and we can help you get set up. Analytics gives you great insight into the people that are visiting your site, and to build a basic profile of the people you will be talking to, you can do the following. Open up Google Analytics, set a date range that will give you a decent chunk of data and visit the Audience tab. Under here you can get a ton of information to help you build your audience profile, let’s start with some of the basics you’ll need. I’d suggest opening up an Excel sheet and dropping this info in. 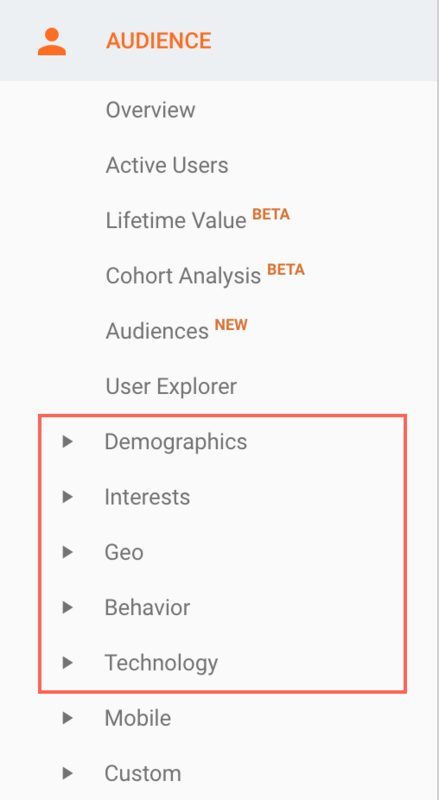 Demographics: Get an idea of the age and gender of your site visitors. Interests: This is a really interesting one. Google takes the data they have of all the users that were logged into their google accounts, and all the details of the sites they’re previously visited to build you a profile of what your site visitoprs are interested in. It will even give you an overview of the market segment they are in. While this isn’t a deadly accurate representation, it can give you a very good idea of your visitors likes and dislikes. Mobile: Know whether the majority of your users are visiting your site from a mobile or a desktop. This can help you shape the content formats that you will be producing. My site is usually visited by women between the ages of 25-34 who are music and movie lover, reading content on their mobiles. Even before we’ve even begun brainstorming any blog topics, this already gives me a great idea of the types of content I could be creating. Step 2 – Tie your audience profile back to your product. You might be thinking to yourself, but how do I tie that back to my business or product? Well the best thing you can do is to break out a pen and paper. Whilst that works great for people who are very visual thinkers, some people like to just go for volume and then tone it back. In this method, you can take the audience you know are visiting you, and just write down as many headlines as you can think of that relate in any way between your product and the audience. It doesn’t matter how terrible it may be, the idea is just to get them all written down. Once you have 20-30 written down you should be able to quickly spot which ones are rubbish, and which ones have good elements to them. You can hack these up and use different parts until you get yourself down to around 3 really good topics. Step 3 – Know what content is being shared. It is worth putting a little bit of time into understanding what content people are sharing. It also comes back to which channels are being used for sharing your content. What you want to be doing, is creating content that you can share across multiple channels without having to do much work to re-create. (Think along the lines of recording a Youtube video which you can release as a video, a podcast, a transcript as a blog post, and then use screenshots etc to make the social links look more engaging). There are a number of tools you can use to get an idea of what your audience are sharing, probably the most popular of which is Buzzsumo. Simply drop in a topic or title of a post, and you will get an idea of exactly how often that type of content is being shared across the various channels. Infographics can be a good way to break through the clutter, and is a very shareable form of content. It is quite easy to find industry reports that you can pick a section and visualise, although this can work really well for businesses that have a lot of data on their hands. Even if you don’t think you have a lot of data, you might be wrong. For example, maybe you’re a florist. All you need to do is look at the sales you made in the week before valentines day, the week of valentines day and the week after valentines day. Suddenly you are able to create a visualisation of the types of flowers bought before and after valentines. Data can come from anywhere. The design of these infographics are easy to get done up quite cheap, and you can either throw up a project somewhere like fiverr or freelancer, or you could speak to someone like us to help you out. Step 4 – Use some online topic generators. The reason I say you can use these, is because you know your product and audience already, so it is easy to filter out topics you know aren’t great. It’s not to say you will always use what they give you, but it allows you to take a bunch of topics, and go back to step 2 to cut and hack up the titles until you get a few you like. Hubspot are pretty much the kings of content, so it stands to reason that they would have a great blog topic generator. This is probably the one we’d recommend most. This is a fantastic tool as well and generated an absolute ton of topics you can write on. Definitely work a go. This is also a great tool for generating topics. Although some of them may be a little bit click-baity, you can quite easily reword them to suit you. This one gives you some good ideas, but doesn’t have the option to drop in any keywords. Still works great though. Don’t be afraid to stray a little bit when it comes to content. If you own a cafe, you don’t need to only be writing about interesting recipes etc. My advice is to sometimes be a little bit abstract with your content, which will bring in people you may not have though you would have. For example, if your cafe happens to be along the London Marathon route, you could write a blog titled “What I learned about perseverance while watching a marathon from a cafe“. You’re tying back to your business, but you’re not making it the focus of the article. The idea is that people are becoming blind to sales, they want content that is interesting and engaging. Plan your posts. I’ve been through both methods of planning and also last minute article writing, and I can tell you for certain that planning ahead eliminates so many headaches, and also means that the content you are producing is of a much higher quality. I hope this post has helped you to to take a step closer to creating some great blog content. I’d love to see what you’re writing about, so leave us a link to your blog in the comments.